DANVILLE, Pa. (WPVI) -- The coordination between different agencies during Tuesday's winter storm helped get a young child to a lifesaving medical procedure. 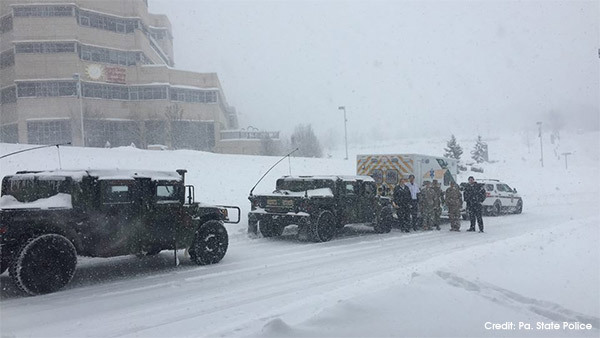 State Police coordinated with the Pa. National Guard and PennDOT to transport a 23-month-old child from Lehigh Valley Hospital-Pocono in East Stroudsburg to Geisinger Children's Hospital in Danville. "PennDOT led the way with a plow train, state police went with the group to make sure they were safe. The National Guard followed up to make sure that if anything happened they could help. And the local emergency responders and healthcare practitioners made sure the baby was safe while they made that trip," said Pennsylvania Governor Tom Wolf. Pa. State Police posted about the cooperative operation on their Facebook page. The post reads in part: "The snow doesn't stop us!" A heartwarming story of cooperation, and going above and beyond for a child in need. Great work to all involved!